"I am pleased to announce that fourth quarter trading has been broadly in line with expectations. At the same time, the traditional batch capture market remains under pressure from the continuing trends of consolidation and commoditisation, thereby rendering it a segment with diminishing long-term opportunity. 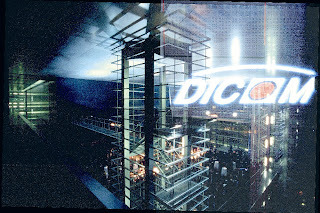 Our further shift towards transactional solutions positions DICOM Group well for future growth. We are confident that these changes will position us to grow our business over the next few years into one of the most successful providers of integrated content capture, transformation and exchange solutions globally." The scribe lives in a perpetual fear and perverse admiration of what the spin meisters of his holdings will unleash in the place of straight talk. The entirely rational basis for this paranoia is that the PR artistes of this morning’s Dicom announcement above, Financial Dynamics, also advised a pre-Weston iSoft plc during its recent near-death trip on a series of pronouncements that collectively might be described kindly (but inaccurately) as disingenuous. Nonetheless, Dicom is a different case. It is jammed in the spit-roast position between an investment public yet to be convinced of its current “new” strategy; and a management indecisive (or incomprehensive) as to how to invest a cash pile of £35m or 40p per share. For a firm worth £158m calls for special dividends are not far away - especially if the touted double-digit earnings fail to materialise. And 10.01% will probably not count. Dicom has improved an array of liquidity, productivity and profitability ratios since 2005 and remains an impressive cash machine in spite of the operating discomfort its regulatory announcements and analyst presentations gloss over. A £3m investment (if that is indeed what it ought to be called) in “more attractive growth areas” (as the update terms it) thus looks eminently reasonable and sensible. If only the owners knew precisely what it was for they might react encouragingly instead of with puzzlement at an announcement of lamentably opaque quality. Does the bulk of public company history not caution against communications strategies that issue the bare minimum information demanded by exchange disclosure requirements? Spirit, please, not just letter. Addendum: a small idea of one source (Open Text Corporation) of likely M&A interest here in case readers thought the reference was a complete joke.